Petitioner :- Ramesh Chandra Tiwari & 3 Ors. Respondent :- State Of U.P. Thru. Secy. Basic Education & 4 Ors. This Application for amendment filed today is allowed. Let the said amendments to be carried out in the writ petition during the course of the day. The petitioners herein have challenged the order dated 29.6.2015 passed by the Secretary, Basic Education, Government of U.P. In respect to them declining their claim to continue in service till the next Academic Session as per the change in definition of Academic Session brought about by the Government Order dated 9.12.2014 on the ground that the said change in the Academic Session for the students has no bearing upon the continuance of the Teachers till the end of the Academic Session, which continues to be governed by the earlier arrangement. "Heard learned counsel for the petitioner as also the learned Standing Counsel and Sri Neeraj Chaurasiya, learned counsel for opposite party nos.2 and 3. By means of this writ petition the petitioner is seeking continuance in service till the end of Academic Session, i.e. 31st March. The petitioner has also challenged a part of the Government Order dated 09.12.2014 and the consequential order dated 22.1.2015. Earlier the Academic Session, as defined in Rule 2 (aa) of the Rule 29 of the 1981 Rules, commenced from 1st of July and ended on 30th June thereafter. Based on the aforesaid provision Rule 29 of the 1981 Rules provided that if the date of retirement of the Head Master or the Assistant Teacher of a recognized school falls on or after July to during the Academic Session, then he shall retire on 30th June following next after the said date. Now, by means of the Government Order dated 9.12.2014 period of Academic Session has been changed. With effect from 2015-16 the Academic Session has commenced from 1st April and shall end on 31st March following next after the said date. The dates mentioned in Rule 29(1) have a rational co-relation to the Academic Session. The object of the Rule is to ensure that teaching of students should not suffer on account of retirement of teachers in mid Academic Session. Once the period of Academic Session has changed from 1st July to 30th June to 1st April to 31st March, the logical corollary of it is that any teacher whose date of retirement falls during the changed Academic Session, shall be entitled to continue till the end of the Session. This is how Rule 29 has to be read in the changed circumstances. The dates mentioned therein, in the absence of an amendment, have to be read down and understood in context of the changed Academic Session, otherwise the provision would be rendered irrational and will lead to absurdity. The contention of the learned standing counsel based on para 3 of the Government Order dated 09.12.2014 that though the period of Academic Session has changed, but this has been done only for the purposes of admission and promotion etc. of students and it has no bearing upon the continuance of the teachers, which, in view of the last line of the aforesaid para 3, continues to be governed by the earlier arrangement and this line is in consonance with the definition of Academic Session contained in Rule 2(aa) and Rule Rule 29 of the 1981 Rules, meaning thereby in spite of the aforesaid change the teachers whose date of retirement falls in mid Academic Session can continue only till 30 June, and not 31 March, 2016. This contention prima facie is incongruous with the object of Rule 29. The dates mentioned in Rule 29 have a rational connection with the period of Academic Session. Once the period has changed and now it is from 1st April to 31st March, then Rule 29 has to be applied keeping in mind the aforesaid Session, and not otherwise. The Academic Session and continuance of teachers cannot be treated separately. The dates mentioned in Rule 29 has to have a rational connect with the Academic Session, therefore, the dates mentioned therein have to be read down as 1st of April to 31st of March, otherwise the provision will be rendered irrational and unconstitutional. A similar change of Academic Session has been made in respect to the schools governed by the U.P. Intermediate Education Act, 1921. In view of the above, as the petitioner's date of birth falls in mid Academic Session which has commenced from 1st April, 2015 and shall end on 31 March 2016, he is entitled to continue till the end of Academic Session. Let counter affidavit be filed within four weeks. It is accordingly provided, subject to verification of the petitioner's date of birth, he be allowed to continue till the end of Academic Session i.e. 31.3.2016 and shall be paid salary regularly subject, however, to the final result of the Writ Petition." As the dates of birth of the petitioners herein, as claimed by them are 1.6.1953, 27.5.1953, 4.6.1953 and 30.6.1953 respectively, therefore, their dates of retirement/superannuation are 1.6.2015, 27.5.2015, 4.6.2015 and 13.6.2015 respectively, which fall in mid of the Academic Session that has commenced from 1.4.2015 and shall end to 31.3.2016. For the reasons, already mentioned in the above mentioned interim order paragraph 4 of the impugned order dated 29.6.2015 is not in consonance with the object of Rule 29, though paragraph 5 thereof does not suffer from any infirmity and writ petitions wherein the persons/petitioners had attained the date of retirement prior to 1.4.2015 and had also availed the benefit of Rule 29 earlier have already been dismissed by this Court. The petitioners have not availed the benefit referred under Rule 29 of the said Rules of 1981. In view of the above, it is provided that subject to verification of the petitioners' date of birth, they shall be allowed to continue till the end of Academic Session i.e. 31.3.2016 and shall be paid salary regularly subject, however, to the final result of the Writ Petition. 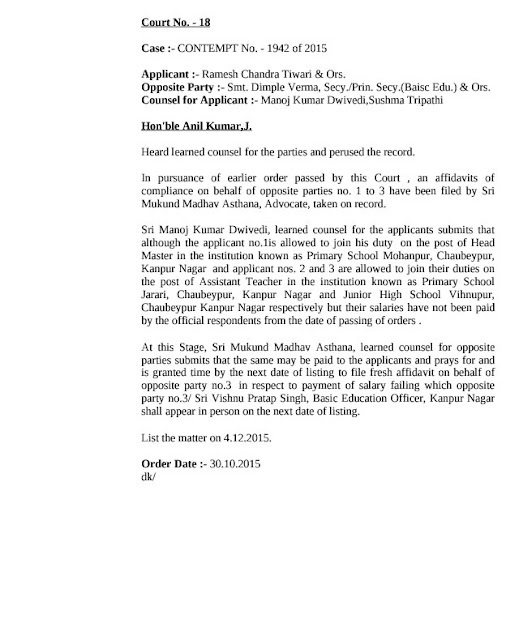 The impugned order dated 29.6.2015 shall accordingly remain stayed till the next date of listing. Let counter affidavit be filed within 4 weeks'. For convenience of reference, we are referring to the parties by their description in the original writ petition. The dates of birth of the four petitioners are respectively 1 June 1953, 27 May 1953, 4 June 1953 and 30 June 1953. Consequently, the dates of retirement of the four teachers on attaining the age of superannuation of 62 years were 1 June 2015, 27 May 2015, 4 June 2015 and 30 June 2015. Until 2013-14, the academic session of primary schools and junior high schools conducted by the Uttar Pradesh Basic Education Board commenced on 1 July and would end on 30 June of the succeeding year. Under Rule 29, a teacher is liable to retire on the last day of the month in which he attains the age of 62 years. Consequently, the four teachers in question would have continued in the normal course until the last day of the respective months in which they attained the age of 62 years. However, the proviso to Rule 29 postulates that a teacher who retires during an academic session would continue to work till the end of the academic session. Since the academic session was between 1 July to 30 June, a teacher who attained the age of superannuation within that period would continue until the following 30 June and such period of service would be deemed to be an extended period of employment. On 9 December 2014, a Government Order was issued by which it was resolved that with effect from academic year 2015-16, the academic session would commence from 1 April and would end on 31 March following year. The Government Order stipulated that the benefit of this would be available for the purposes of admission, promotion of students and for conducting the institutions. However, it was contemplated that this would not affect any change in the grant of 'sessional benefits' to teachers who, in consequence, would be granted the same benefit as before. The State Government issued another Government Order on 29 June 2015 clarifying certain directions which had been issued in the meantime on 15 June 2015 and 19 June 2015. The teachers in the present case filed a writ petition3 in order to challenge a decision which was taken by the Secretary, Basic Education on 15 June 2015, relying upon the terms of the Government Order. The view of the Secretary, Basic Education was that the teachers in question would not be entitled to the sessional benefit beyond 30 June 2015. The learned Single Judge, by an interim order dated 30 June 2015 held that since the dates of superannuation of the petitioners were respectively on 1 June 2015, 27 May 2015, 4 June 2015 and 30 June 2015, which fell in the midst of the academic session that had commenced on 1 April 2015 and was to end on 31 March 2016, the petitioners would be allowed to continue till the end of the academic session, i e until 31 March 2016 subject to the verification of their dates of birth. The learned Single Judge noted that the petitioners in the present case had not already availed of the benefit of Rule 29 earlier. Accordingly, an interim order was passed in the aforesaid terms. The State is in appeal. Since the issue which arose before the Court is a pure question of law and in the interest of rendering finality and certainty, we have by consent of all counsels taken up the writ petition for hearing and final disposal. No issue of fact is to be resolved in these proceedings and the entirety of the matter turns on an appreciation of the relevant Rules and Government Orders. "In the present case, the first respondent attained the age of sixty two years in the month of July 2014. Under the unamended Regulation 21, since the date of retirement of the first respondent fell within the midst of the academic session, he was allowed to continue as a Lecturer until 30 June 2015. The first respondent continued on that basis until 30 June 2015. What the first respondent seeks, essentially is a further extension in service until 31 March 2016 which, in our opinion, would be impermissible. The benefit of such an extension under the amended regulation would clearly not be available to a teacher in the position of the first respondent who had already attained the age of superannuation prior to 1 April 2015. The first respondent had already availed of the continuance in service until the end of the academic session, which according to the unamended regulation, was to come to an end on 30 June 2015. The State Government by a Government Order dated 25 May 2015, clarified that such an employee would continue until 30 June 2015. In other words, the first respondent would not be entitled to a further extension in service until 31 March 2016." In that case, the learned Single Judge had granted an interim order allowing the teacher to continue to work until 31 March 2016. The petition was heard finally by the Division Bench since questions of law had arisen and both the State and the counsel for the petitioner had stated that the matter may be heard and disposed of finally. The principle which was laid down in the judgment of the Division Bench is that a teacher, who had already taken the benefit of an extended period of employment until 30 June 2015, would not be entitled to a further extension until 31 March 2016. "The basic issue before the Court is whether a person who had already attained the age of superannuation prior to 1 April 2015 and who had availed of an extension of service until the end of the academic session would be entitled to a further extension of service until 31 March 2016. In answer to this question, what must be emphasized is that the purpose of granting an extension of service until the end of the academic session is to protect the interest of education of the students so that the retirement of a teacher during the midst of an academic session does not result in disrupting the cause of education. This was also adverted to in a judgment of a Division Bench of this Court in Surendra Prasad Agnihotri vs. State of U.P. and ors.7 upon which reliance has been placed by the learned Single Judge. In the case of the appellants, it is clear that they attained the age of superannuation in January 2015 during the midst of academic year 2014-15. Hence, they were granted an extension of service until the end of the academic session which then stood as 30 June 2015. The date of superannuation is not postponed as a result of Regulation 21 but employees are only granted an extension until the end of the academic session. Once having availed of the extension of service until 30 June, the appellants would not be entitled to a further extension of service until 31 March 2016. The appellants would not be entitled to claim that as a result of the change in the academic year now to 1 April - 31 March, their date of superannuation falls in the midst of the academic year thereby entitling them to a further extension of service. The appellants have already availed of an extension of service and there would be no occasion granting them a further extension." 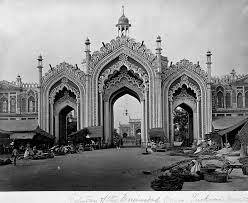 The same view has been taken by a Division Bench of this Court at Lucknow in Krishna Chandra Pal Vs State of U P8. In that case, the teachers had already attained the age of superannuation between 14 July 2014 and 31 December 2014 which was within the academic session 2014-15 and were, therefore, continued until 30 June 2015. The Division Bench held that Regulation 21 would not entitle them to a further extension until 31 March 2016. Primary schools are governed by the provisions of the Uttar Pradesh Basic Education Act, 1972 and the service conditions of the teachers are governed by the Rules framed under the Act. Rule 29 lays down (i) the age of superannuation which is 62 years; (ii) the principle that a teacher who attains the age of 62 years will retire from service on the last day of the month in which the age of superannuation is attained; and (iii) the principle that a teacher who has retired during an academic session, shall continue to work till the end of the academic session and that such period of service will be deemed to be an extended period of employment. The proviso to Rule 29 enacts a legal fiction through the subordinate legislation, the effect of which is that though a teacher has attained the age of superannuation, the teacher, notwithstanding the fact that he or she had retired during the academic session, will continue to work until the end of the academic session and that such period of service will be deemed to be an extended period of employment. Rule 29 refers to the academic session as being 1 July to 30 June, since this was the academic session which prevailed right until academic session 2013-14. The reason why a special provision is made in the proviso to Rule 29 is to ensure that the educational needs of students are not disrupted by the retirement of a teacher in the midst of an academic session. In other words, the benefit is extended not so much for teachers (though the teachers would obviously also receive the benefit of an extended period of employment) but primarily to protect the students whose education would be disturbed by the absence of a teacher for the academic session. The State Government can certainly alter an academic session, as it has, to 1 April-31 March. The consequence, however, of a change in the academic session as provided under Rule 29 cannot be altered so long as the proviso to Rule 29 continues to hold the field. What the proviso enacts is that a teacher who retires during an academic session will continue to work until the end of the academic session on the basis of a deeming fiction, as we have noted above. Once the academic session has been changed, the principle which has been enunciated in the proviso to Rule 29 will apply to the newly altered academic session. All that really remains now is for the State to make a consequential change in the date of the new academic session under the proviso to Rule 29 but that part is merely clarificatory of the decision which has already been taken of the dates of commencement and conclusion of the academic session. In the present case, we find from the diverse Government Orders which have been issued by the State Government that there has been a considerable degree of ambiguity and a lack of application of mind which could have best been avoided. The State Government issued a Government Order on 9 December 2014 stating that a decision has been taken to alter the academic session from the erstwhile 1 July-30 June to 1 April-31 March. This change in the academic session was to take effect from 2015-16. In other words, on and from 1 April 2015, the new academic session has taken effect and which will continue until 31 March 2016. A teacher whose normal date of retirement upon attaining the age of superannuation of 62 years falls within the academic session would be entitled to the benefit of an extension of service until 31 March 2016. Obviously, as the two judgments of the Division Bench of this Court at Allahabad and the judgment of the Division Bench at Lucknow have held, a teacher who has continued in service until 30 June 2015 by virtue of the operation of the proviso to Rule 29 and who has already taken a benefit of the proviso, would not be entitled to a further extension of service till 31 March 2016. Consequently, as we have noted earlier, the teachers in the cases which were decided by the Division Bench at Allahabad had already attained the age of superannuation in July 2014 or, as the case may be, in January 2015. These teachers had been continued until 30 June 2015 which was the earlier academic session, in pursuance to the proviso to Regulation 21 (applicable in the case of intermediate institutions). However, a teacher who attains the age of superannuation during academic session 2015-16, as modified, and who has not taken the benefit of the proviso to Rule 29, would be entitled to continue in service until the end of the academic session which would be 31 March 2016. The Government Orders which have been issued from time to time, more particularly on 9 December 2014 and 29 June 2015 have to be necessarily brought in line with the mandatory requirements of the proviso to Rule 29. As we have observed earlier, the power to alter the academic year undoubtedly vests with the Government but having once altered the academic year, the consequence which is envisaged under the proviso to Rule 29 must ensue. The State Government cannot by a government order override the proviso to Rule 29. That is part of subordinate legislation which cannot be simply disregarded by an administrative order. On the facts of the present special appeal, the dates of superannuation of the four respondent teachers would respectively be 1 June 2015, 27 May 2015, 4 June 2015 and 30 June 2015. All these teachers worked in academic session 2015-16 commencing from 1 April 2015 in the normal course, without taking the benefits of the proviso to Rule 29. Since the dates of their retirement fell in the midst of the academic session, they would plainly be entitled to continue in service until the end of the academic session, as envisaged in the proviso to Rule 29. The Secretary, Basic Education, Government of U P, who decided upon the issue on 15 June 2015 has taken a view clearly contrary to the mandate of the proviso to Rule 29. For these reasons, the order dated 15 June 2015 passed by the Secretary, Basic Education shall accordingly stand quashed and set aside. We have taken up the writ petition by consent for final hearing at this stage having due regard to the need to resolve the question of law and to ensure that a measure of certainty is established as a result of the alteration in the academic session as notified by the State. In that view of the matter, we have taken up Writ Petition No 3653 (S/S) of 2015 for hearing and final disposal. Since no further issue would survive in the writ petition filed by the respondents (original petitioners), both the special appeal and the writ petition shall be governed by the present judgment and are accordingly disposed of. The delay of 13 days in filing the special appeal is condoned since sufficient cause has been shown in the affidavit filed in support of the delay condonation application. The delay condonation application stands disposed of. There shall be no order as to costs. Applicant :- Ramesh Chandra Tiwari & Ors. Opposite Party :- Smt. Dimple Verma, Secy./Prin. Secy. (Baisc Edu.) & Ors. Petitioner is alleging willful non-compliance of the interim order dated 30.6.2015 passed in writ petition no. 3653 of 2015 (SS): Ramesh Chandra Tiwari and 3 others Vs. State of U.P. and others, where by the writ Court while allowing time for exchange of pleading directed that subject to verification of the petitioners' date of birth, they shall be allowed to continue till the end of Academic Session i.e. 31.3.2016 and shall be paid salary regularly subject to the final result of the Writ Petition. Submission of the learned counsel for the petitioner is that against the interim order State Authorities preferred a Special Appeal (Defective) No. 3605/2015 and the same was dismissed vide judgment and order dated 20.8.2015. It is also submitted that the Copy of the order of the writ Court was sent to opposite parties through post on 6.7.2015 followed by reminder on 17.7.2015, but till date no action has been taken, therefore, the petitioner is constrained to approach this Court by means of the present petition seeking appropriate action be taken against the opposite parties for willful disobedience of the order of the writ Court under the Contempt of Courts Act. Appreciating the submission of the learned counsel for the petitioner and perusal of the record, prima facie, a case for willful disobedience of the order of the writ Court is made out against the opposite parties. Let notice be issued to opposite parties to appear before this Court on 30.10.2015 to show cause as to why proceedings be not initiated against them under the provisions of Contempt of Courts Act for willful disobedience of the aforesaid order of the writ court. List this case on 30.10.2015. It is provided that if order of the writ Court is complied with and affidavit of compliance is filed, the opposite parties need not appear before this Court on the date fixed. Counsel for the petitioner is directed to furnish a copy of the contempt petition to Standing Counsel, who shall transmit the same to the opposite parties along with gist of this order at the earliest for information and necessary compliance. In pursuance of earlier order passed by this Court , an affidavits of compliance on behalf of opposite parties no. 1 to 3 have been filed by Sri Mukund Madhav Asthana, Advocate, taken on record. 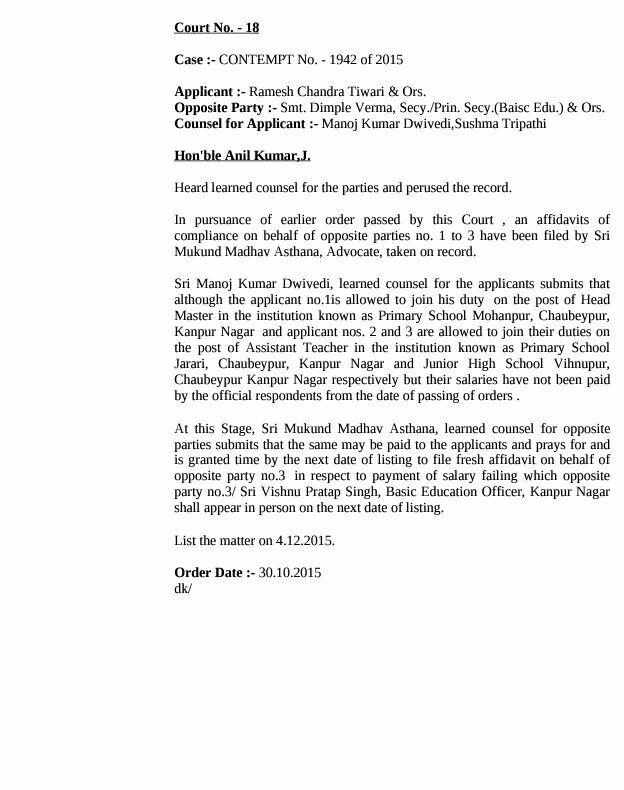 Sri Manoj Kumar Dwivedi, learned counsel for the applicants submits that although the applicant no.1is allowed to join his duty on the post of Head Master in the institution known as Primary School Mohanpur, Chaubeypur, Kanpur Nagar and applicant nos. 2 and 3 are allowed to join their duties on the post of Assistant Teacher in the institution known as Primary School Jarari, Chaubeypur, Kanpur Nagar and Junior High School Vihnupur, Chaubeypur Kanpur Nagar respectively but their salaries have not been paid by the official respondents from the date of passing of orders . 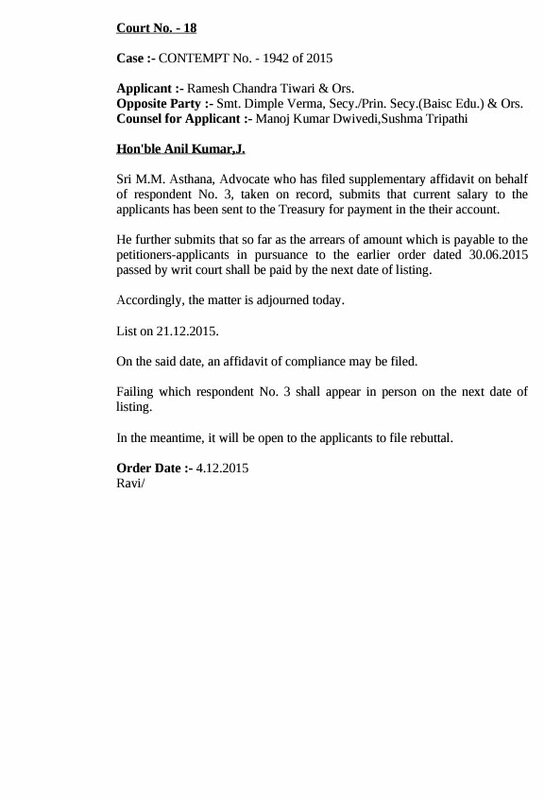 At this Stage, Sri Mukund Madhav Asthana, learned counsel for opposite parties submits that the same may be paid to the applicants and prays for and is granted time by the next date of listing to file fresh affidavit on behalf of opposite party no.3 in respect to payment of salary failing which opposite party no.3/ Sri Vishnu Pratap Singh, Basic Education Officer, Kanpur Nagar shall appear in person on the next date of listing. List the matter on 4.12.2015. Sri M.M. 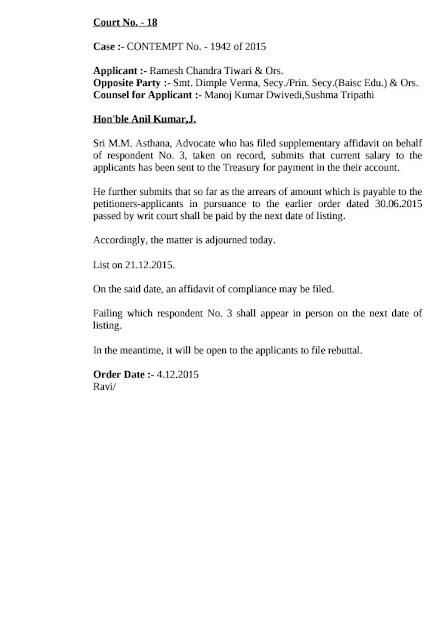 Asthana, Advocate who has filed supplementary affidavit on behalf of respondent No. 3, taken on record, submits that current salary to the applicants has been sent to the Treasury for payment in the their account. He further submits that so far as the arrears of amount which is payable to the petitioners-applicants in pursuance to the earlier order dated 30.06.2015 passed by writ court shall be paid by the next date of listing. Accordingly, the matter is adjourned today. On the said date, an affidavit of compliance may be filed. Failing which respondent No. 3 shall appear in person on the next date of listing. In the meantime, it will be open to the applicants to file rebuttal.